One of the most effective elements of an online presence is gathering data from your visitors by having them register for email alerts, send a contact form, sign up to volunteer, and more. You can then leverage this data to keep your visitors up to date on important organization happenings, offers, and more. Many sites (and almost every site that we design) have a quick email registration option at the top or in the margin of their main site. This feature allows visitors to easily and painlessly give the organization their email address for future updates and offers. The ease of registration is not only a core principle of a successful landing page design, but also an important tenet of any web design strategy. The only thing worse than not having a signup is having one that is buried deep in your site and is frustrating to visitors. This is where the US Airways website comes in. 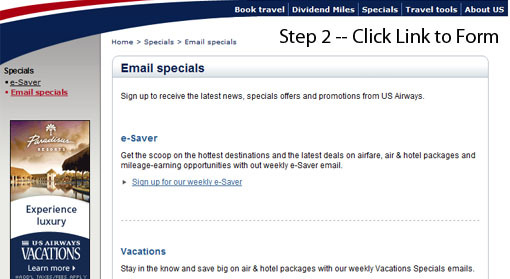 I recently went to the site to register for their e-saver program to be kept up to date on upcoming travel deals. This is a prime opportunity for US Airways to capture my opted-in data and convert me from a lead to a sale in the future. I was first surprised that there wasn't a signup immediately available on the front page. My surprise turned to disgust after navigating three pages, an email confirmation, and captcha entry to finally be registered. They made me work to sign up for a simple email alert as hard as Kayak makes you work to book an entire trip. 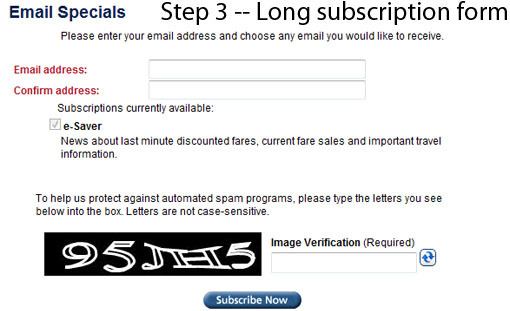 To signup, I had to go to the Specials dropdown menu, choose the email alerts option, clarify my choice on that page by clicking e-saver, enter my email address twice, and then decipher a captcha. I went from being excited to signup to incredibly frustrated with the airline. I don't think it's out of the question at all to assume at least 15% of desired registrants abandon the process out of confusion before signing up. Don't make your visitors work to give you their data. By having a registration always available in your header or sidebar, or just a simple call to action, you'll make it easy for visitors to get in contact with you and you will have more leads. We've seen this work time and time again with everyone from corporate websites to the success of political splash pages. Encourage visitors to interact with your web presence by making it as easy as possible for them to sign up for alerts and submit contact forms. By making it easy for visitors, you will not only win more signups out of convenience to them, but you'll also be sending an important message that you value their time and input.